A teacher at one of our elementary schools shared this recently. She was talking about how she encourages her students to persist in the face of difficulties. Instead of saying something that makes a wrong answer seem like a curse or worse, she encourages the process. She says to students with curiosity and wonder, "Oh, that's my favorite mistake!" Students are then able to view problem-solving as something that is not just about getting a right answer. It's about having thinking that perseveres. It's about staying with the problem longer. 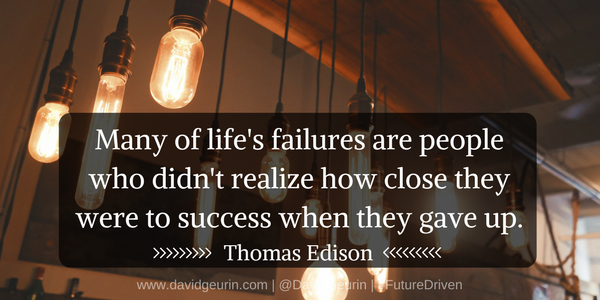 Thomas Edison failed over and again in trying to invent the incandescent light bulb. He documented 1,000 failed attempts before he was successful. When a reported asked him how it felt to fail 1,000 times, he replied, "I didn't fail 1,000 times. The light bulb was an invention with 1,000 steps." Our district has adopted new math curriculum, and it's challenging. But kids are rising to the occasion. And a big reason it's successful is the focus on the process and the greatness of teachers to promote perseverance and model growth-mindset thinking. Here are five questions to ask your students to help them reflect on their own mindset. The questions might need some unpacking for younger students. But I think all kids can think about these ideas. 1. When I start to feel like quitting, what will I do in that moment to persevere? This might be the most powerful question on the list. When people decide exactly how they will respond to a difficulty in advance, they are far more likely to push through in the face of the challenge. 2. What are my thoughts telling me about how successful I might be at learning this skill? If these thoughts are limiting to me, how might I think differently? Lots of kids are thinking thoughts that are self-limiting. "I'm not good at math" for instance. It's helpful to think of phrases that are filled with belief and resourcefulness to replace the negative thinking. Teachers can help students find the words for this. 3. What am I saying or doing to myself that is holding me back? There are many things that can undermine a growth mindset. Excuses, justifications, worries, perfectionist thinking, thought patterns, past failures, etc. It's important to recognize what unhelpful beliefs students need to overcome. 4. What would I want my teacher to say to me when he/she sees me taking a risk, trying hard, or pushing through mistakes to pursue this goal? This question is helping to shift the perspective to expecting success. When I try hard, good things happen. My teacher will say this to me, and that feels good. 5. Imagine how you will feel when you accomplish something that is really challenging. Describe that feeling. Again, this one is beginning with the end in mind. Getting a picture of success is so important. Humans are the only creatures on the planet with imagination. We can experience the whole range of emotions through our minds. Visualization is extremely valuable. It teaches the brain to expect success. When gymnast Mary Lou Retton won her first gold medal, a reporter asked her, "How does it feel to win gold?" She replied, "Just like it's always felt." "But this is your first gold medal?" said the puzzled reporter. "Yes, I know. But I've experienced this moment thousands of times in my mind," she explained. The power of belief cannot be understated. What do you think about these questions? Do you have suggestions for other questions that might be helpful for students? Leave a comment below or respond on Facebook or Twitter.